I love thrillers, but I'm kind of a snob about it. I don't have much patience for poorly-written, brightly-colored paperbacks like you find in the grocery store. I like a good police procedural, a salacious murder mystery, but for the love of Pete, put some effort into the writing! I want to be entertained, but somewhere in my brain lives an air horn that sounds every time I come across a tired cliché or stilted dialog. The air horn...it's loud. And I can't turn it off. So I'm absolutely delighted to report that Belinda Bauer's Rubbernecker passes the air horn test. It's relentlessly fast-paced and whip-smart—and the “detective” on the case is an anatomy student with Asperger's. Sounds like a winning formula to me! Patrick has been fascinated with death ever since his father was killed by a hit-and-run driver when Patrick was a child. His penchant for collecting animal carcasses and examining them in his bedroom was only one of many reasons he was difficult for his mother to raise on her own. Now he's an adult and an anatomy student at a medical school. He's hoping that by studying cadavers, he can find some insight into where exactly his father went after being struck by the car. As Patrick and his lab partners begin their dissection, however, they make a strange discovery that leads him to believe their cadaver didn't die from the cause listed in the chart. Due to his Asperger's, Patrick isn't the kind of person who is able to let things go easily. What follows is his dogged pursuit of the truth—what really happened to Cadaver #19, and who is responsible. Bauer captures well the quirks of Patrick's psyche. Even as his actions are bizarrely inappropriate to the people around him, they are perfectly logical to us, if still inadvisable. He gets himself into very real danger, and there are a few heart-pounding, grisly scenes—though they're always tempered with humor, given Patrick's personality. He's quite adept at evasion, possibly because he's spent most of his life avoiding being touched by others, and contains an instinct for self-preservation that surprises even himself. Rubbernecker is a thoroughly entertaining thriller. 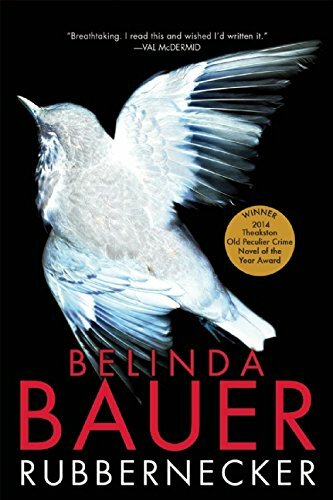 I'll definitely be reading more of Belinda Bauer's books in the future. With regards to Grove Atlantic and NetGalley for the advance copy. On sale in the US August 14.